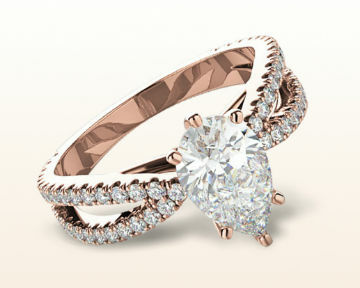 With their warmth and romantic vibe, rose gold engagement rings are definitely having a moment. And among those looking for a unique style, pear-shaped diamonds been turning heads since style icons like Elizabeth Taylor started prominently rocking them in the '70s. 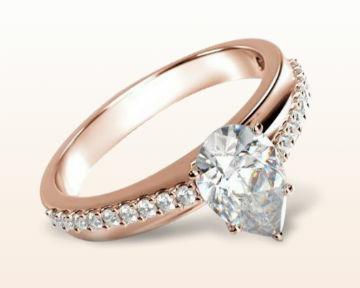 Combine the two, and you have a look that's beloved by many brides-to-be. Here are some important things to know about rose gold and the pear cut, and some of our favorite styles that combine the two into gorgeous rose gold pear shaped engagement rings. Are pear shaped engagement rings popular? Although they've been rising in popularity over the last year, pear-shaped engagement rings aren't quite as trendy and widespread as styles like the emerald cut. Because they're still somewhat under-the-radar, they're a great choice if you want a unique engagement ring. 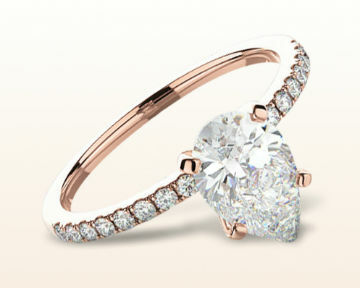 What about rose gold engagement rings? Although white gold has been the top-selected metal for engagement rings for some time, rose gold has surged in popularity the last few years. What's made it so popular? Its symbolism — the pinkish hue is synonymous with the heart and romance — plus the warm glow that gold brings to a setting. How do you wear a pear shaped engagement ring? Whichever way you prefer! Wearing it with the point facing up, toward the fingernails, has more of a slimming effect on the hand than when it's flipped the other way. But it all comes down to personal preference. Some women even like to rotate the ring, switching between point-up and point-down as the mood strikes! Although there's no end to the styles that combine these two elements, the styles below are our favorites of the rose gold pear shaped engagement rings. They represent a wide range of elements, ranging from classic to modern, that take these two characteristics and turn them into strikingly unique styles. 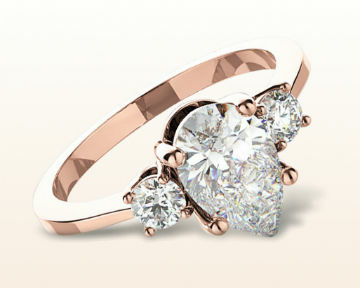 You're sure to find a rose gold pear diamond ring in the collection that fits your tastes. In this timeless look, pave accent diamonds and polished prongs beautifully showcase a pear cut diamond, making this engagement ring perfect for any hand. 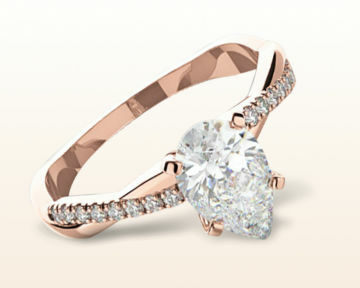 It's also the perfect ring for the bride-to-be who loves simple engagement rings. It's elegant without being plain thanks to the band encrusted with accent diamonds. In this classic three-stone style, a pear cut diamond is flanked by two sparkling round accent diamonds, held in a sparkling four-prong setting. 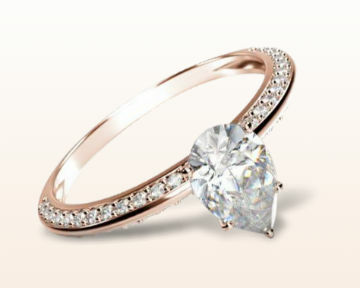 With its petite band, the style is perfect for a center diamond of any size. 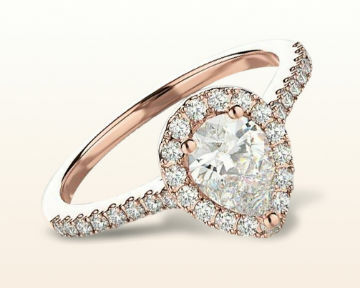 The side stones are just big enough to add more sparkle without stealing the show from the gorgeous teardrop diamond. A romantic twist. This slim, wavy band holds a central pear and 0.19 cts of accent diamonds; rose gold makes the stones and subtle design stand out. The two vines dance around one another as they lead to the center of this pear diamond engagement ring, and the difference between the pave and plain creates a beautiful balance to the eye. 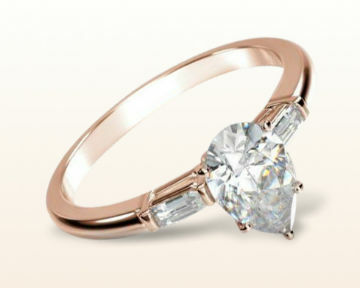 In this sleek, classic three-stone setting, a center pear is accented by baguette side stones. Since the baguette diamonds line up perfectly with the band, there's nothing to grab attention away from that gorgeous teardrop diamond at the center of your glowing rose gold engagement ring. And since they're step-cut diamonds, they give off larger flashes of light, differentiating them from your pear shaped diamond, which will sparkle (instead of flash) thanks to its brilliant faceting. In this ring, a romantic pear diamond is framed by a pave halo and 0.36 carats of accent diamonds, creating a rich, full field of sparkle. A halo setting is perfect for the rose gold pear shaped diamond ring since it adds up to a half carat to your center stone, drawing all eyes to the unique and undeniably romantic shape of your center stone. In a lovely blend of classic beauty and unique design, this ring's pear diamond is accented with top- and bottom-facing pave stones. Although you may not look at the profile of your rose gold pear ring that often, everyone who admires your ring will see the gorgeous sparkles coming from your ring on both sides. It's a show stealing piece. Elegant princess-cut accent diamonds ascend toward a central pear in this traditional sidestone setting. And because princess cut diamonds fit perfectly flush to one another in this channel setting, the band of your engagement ring will look like a field of sparkle instead of separate stones. You'll be amazed at how dazzling these accent diamonds are even though they extend only halfway down the band. In this elevated design, two slim rows of accent diamonds (0.16 cts) rise toward the center stone; a rose gold prong setting makes each gem pop. And since the two slim rows are offset, mimicking a bypass engagement ring, your eye dances around the center stone, making it almost impossible to look away from that stunning pear shaped diamond. This charming ring riffs on intricately detailed Victorian design, as milgrain-bordered accent diamonds set off a sparkling center stone. Although the ring is modern, the warm glow of rose gold on this antique style engagement ring makes it an instant family heirloom that you'll pass down generation to generation. 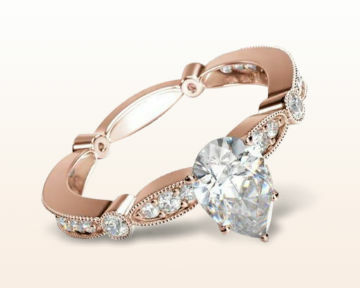 And the teardrop diamond's romantic shape is a natural pairing for the almost lace-like design of this charming band.